What Factors Have Encouraged the Emergence of Women Entrepreneurs? With women dominating in so many areas today, it’s no surprise that the driving force behind many of the new and upcoming businesses are women. They bring their inspiration, know-how and funding, and they churn out great results. Since the 20th century, women entrepreneurs have shaped the economy in an unprecedented way. 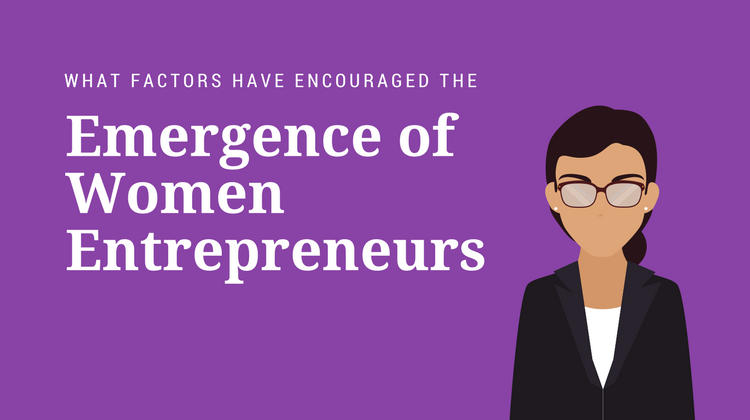 In the last decade or so, the rate of increase in the number of women entrepreneurs have become almost double of that of their male counterparts. Women-owned businesses represent nearly 30% of the total firms in the US, which in absolute figures is 9.4 million. The figures are healthy if you compare them with the 20th-century reports. If we go by sheer numbers, most of the funding still comes from men but the statistics are being pulled in favor of women at an impressive rate. The sudden spurt in the growth of women entrepreneurs in the community can be owed to a number of factors such as the changing outlook of people, the rising number of women working in all sorts of industries, the feminist movement, increase in the level of education, changing roles in society, and a thousand other reasons. It’s not just one or two areas where women are the new and upcoming faces. This phenomenon is spreading to many other fields. One of the attributing factors is the reduction of the gender gap. The demarcation in the assignment of different roles to each separate gender is dissolving quickly. The roles defined by society in the past are no longer shackling women. The thrust is fueled by the changing attitude towards women in society as they rise up to challenges, raise their voices against the wrong, and take a stand for themselves. With the gap fast closing, it surprises few when women are the leaders of upcoming businesses. Women still have to struggle to grab equal opportunities, but the race to win is a close one, with women having slightly greater chances to win. It’s not just the comparison with men that has hindered the success and development of women until very recently. In the past, the umpteen amount of stereotypes associated with women have limited them to the confines of their homes or inferior roles. However, women fought bravely against those stereotypes, broke the glass ceiling, and flew with majestic wings of courage and success. Society had imposed various roles and adjectives on women so there used to be a very limited number of professions for women to choose from. With the opportunity to break these stereotypes, women have redefined their roles and adjectives. They no longer stick to the professions that society expected them to stick to. Most of us have people who we look up to. They can be a part of our personal lives or famous people who we don’t know personally. With the emerging women who take on the responsibility to inspire young girls, the responsibility of a role model has increased significantly. With successful women in business like Sheryl Sandberg, Indra Nooyi, Melinda Gates, Oprah Winfrey, Angela Merkel, and Cher Wang influencing women around the world to take the wheel in their hands, we are set to look at a world filled with success stories of women entrepreneurs. Women working as employees face many issues, and one of the most common is the lack of fair pay and promotions. This is reflective of the values and stereotypes that prevail in an organization and the culture upheld by the management. Many women have complained about the problem but it continues to be an obstacle for women. In hopes of not losing their jobs, a lot of women don’t fight against these unfair barriers. Few are willing to risk everything in an attempt to break the walls, but some do revolt against the unfair pay and pursue building their own empires instead. Push factors include situations that push women to earn a living one way or the other. These are the situations when women don’t have a choice but to earn, like the death of the breadwinner of the family, a sudden fall in the income or a family income that is too low. In such circumstances, some women take jobs whether they’re happy doing them or not. They’ll do what it takes to care for their families. For some women, the solution is to push past barriers and build their own firms. Pull factors attract women to the world of business. They are the influences that motivate women and make them want to compete. A woman’s desire gain recognition, respect, importance, social status, and economic independence are some common pull factors. In addition to these factors, the Feminism movement is also influencing many women to prove that women can stand shoulder to shoulder with men and to bring about change in the perception of women and their roles, rights, and freedoms. With an attitude of, “What men can do, women can do better,” women are poised to run the world. Armed with naturally better social skills and increasing opportunities for higher levels of education, women don’t need to shy away from starting something of their own and making it a success. Giving men a run for their money, women have emerged as the modern day heroes in the business world, boosting the slacking economy and creating jobs. The ever-growing number of women entrepreneurs will continue to grow, and women in business are here to stay. The wheels have been set in motion and there’s no looking back from this trend. Nishant Sinha is the co-founder of Transtutors.com, an online assignment help platform for students of graduation and post-graduation level. It has been his passion and vision to help the students across the globe that he, along with his co-founder, started this venture.